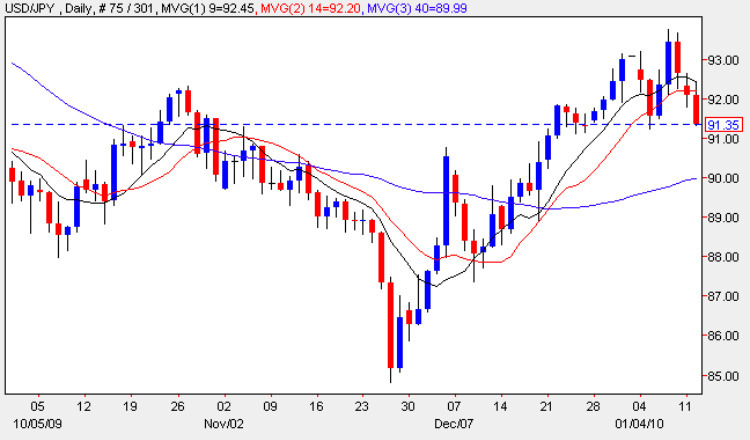 Yesterday’s candle on the yen to dollar daily chart ended the trading session as a doji with a narrow spread and wicks to both top and bottom, suggesting an indecisive market that is now looking for some direction in the 92 to 93 price region. The rally of the last few weeks, which was triggered by an intervention by the Bank of Japan towards the end of November, now appears to have temporarily run out of steam at the 93.50 price point where we have a neat tweezer top configuration of candles which is duly delivering a downwards trajectory today. This reversal may well be short lived as we now have deep and sustained potential resistance immediately below which should provide the base required for a continuation in the recent rally, and rest assured should we see the yen show any signs of strengthening we can guarantee the BOJ will step in once again. With the daily price having broken both the 9 and 14 day moving averages the 40 day moving average will be key in dictating the strength (or otherwise) of any fall, and to the upside a break above 93.50 is now the key level for a move higher. With only the US trade balance figures due today (which are expected at -34.9bn, worse than previous) all we can expect in this pair is some rather desultory sideways price action.